The pamphlet in panel two says "The Greek God of Pamphlets", hence the toga. How the heck Sarah knows of [[2008-04-16|Victor]], let alone his pamphlets, is a question for the ages. Catalina's entire character was basically developed backwards from this event. While planning so far ahead can be frustrating from a "are we there yet?" 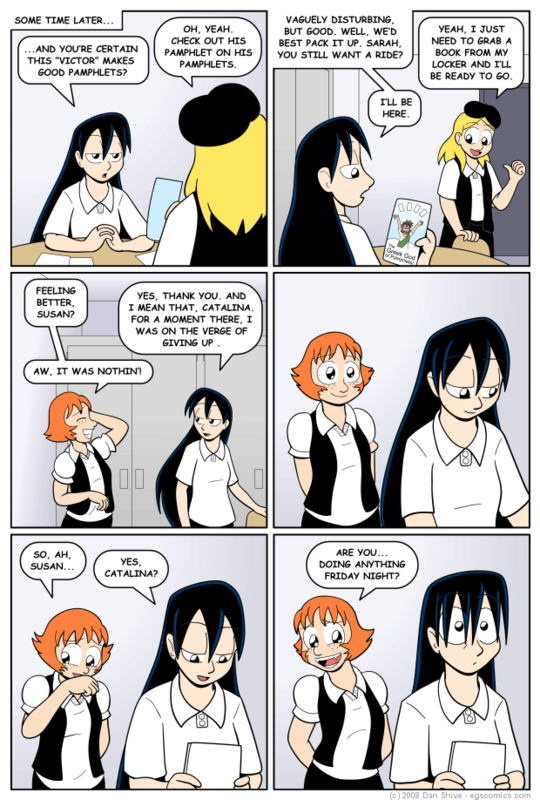 perspective, it can be helpful in that it allows the characters to develop into complex characters before they show up even if their initial conception was from a simple idea, such as "a girl who asks Susan out". And yes, there is more to Catalina than calling people "jackass", which she's likely to do less of in the future due to magical literature fairies leaving a thesaurus underneath her pillow.